GOODYEAR, Ariz. — All-Star second baseman Scooter Gennett will miss the opening months of the season with a severe groin strain, costing the Cincinnati Reds their most productive hitter less than a week before opening day. The Reds overhauled their outfield and their starting rotation through a series of off-season trades, but the infield had been set with Joey Votto at first, Gennett at second, Peraza at shortstop and Eugenio Suarez at third. 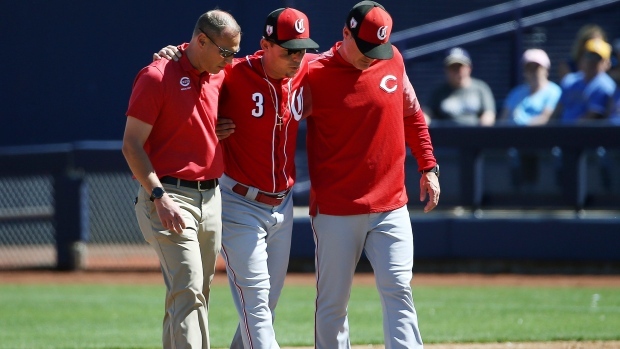 Gennett's injury is a significant setback to the offence. In the last two years, Gennett has 50 homers and 189 RBIs, joining Dave Parker and Deron Johnson as the only Reds to put up such numbers in their first two seasons with Cincinnati. He is only the second baseman in Reds' history with eight homers and 24 RBIs in a month — and he has done it twice.